Heavy corrugated steel sides and deck make Steel King’s Round Corner Corrugated Containers a rugged and durable general-purpose industrial container. 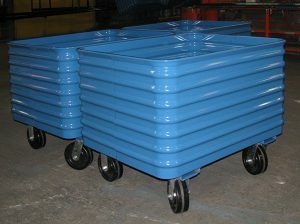 Looking for low cost bulk industrial storage for parts? 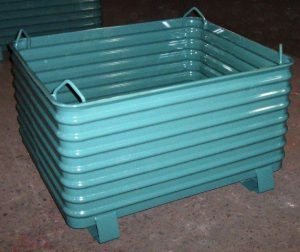 Look no further – Round Corner Corrugated Containers are the answer. 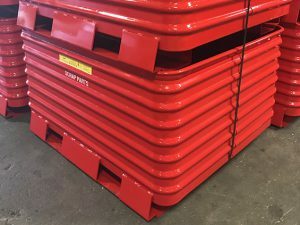 When you’re sourcing steel containers, remember that Steel King stocks a number of Round Corner Corrugated Container sizes in our Quick Ship program. Steel King’s standard round corner containers are available in a wide range of sizes and 4 standard colors: vista green, precaution blue, yellow and poppy red. Steel King’s round corner containers are available with a wide variety of options and accessories. If you don’t see what you’re looking for, just ask!